Operate by Cassava Enterprises, a subsidiary of 888 Holdings, Arcade Spins is not so much a new site, as a rebrand of Deal or No Deal Casino, which did not receive the success it anticipated on release. Arcade Spins has a lot going for it, but it also has some unpleasant downsides, such as unexpectedly low banking limits (£1,000 per day, £2,000 per week, £5,000 per month, as well as a 48-hour pending time on winnings and up to seven working days before pay-out after that period), and some frankly appalling terms on some bonuses, for example, a free spins bonus on your first deposit is capped at £1. That is not the worst of the terms and conditions problems at Arcade Spins however, as low-risk betting, which many of us would consider simply being careful, is seen as abuse of bonuses at this site, and may result in your winnings being taken away, and may even lead to you being banned from the casino. Arcade Spins may have lost the Dead or No Deal Casino name, but it clearly still has the corporate unpleasantness that was attached to it, which is a shame. However, if you are not a low-risk gambler, and bonuses are unimportant to you, maybe Arcade Spins is worth your attention, it’s a good-looking site with a nice, nostalgic theme, which feels both old school and modern at once, and that is likely to appeal to many players. For all its faults, Arcade Spins is a great looking site. A purple and blue vintage design concept takes you back to the arcades of old, while the content and navigation has a modern feel to it. It’s hard to bring together the old and new, we have seen many online casinos try and fail to do just that over the years, but Arcade Spins has executed this difficult procedure perfectly. There is a huge number of games on offer here, and these are used within the design, with thumbnails making a block of colour and stunning artwork that works beautifully against the subtle design of the site in general. 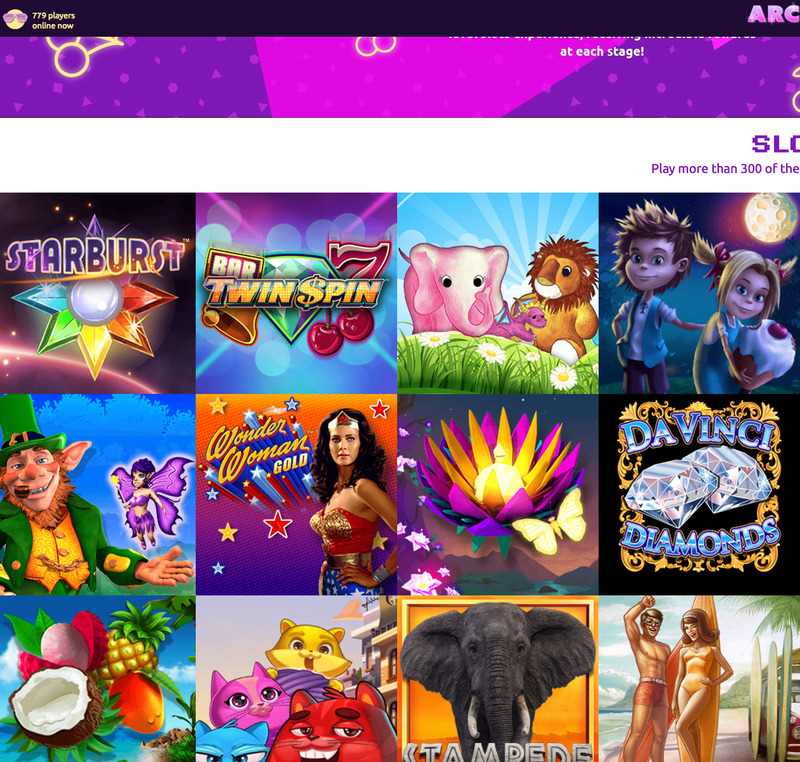 Coming from its previous concept when the casino was Deal or No Deal, which was predictable, basic, and uninspired, Arcade Spins undoes all that poor work and creates one of the best-looking sites that we’ve seen in a long time. Looks aren’t everything, but in the world of online casinos, they are important, and you’ll struggle to find a casino that follows through on its theme as well as this one does. When we said there was a lot of games to try out here, we weren’t exaggerating. With titles coming from 888 Holdings, Bally Wulff, Blueprint Gaming, Eyecon, IGT, NetEnt, NextGen Gaming, NYX Gaming, PariPlay, SG Gaming, Thunderkick, and Williams Interactive, there’s a genuinely impressive collection of games here. As the name suggests, slots are the main focus of this site, and you will find all your favourite slot games, old and new, alongside an abundance of games that you are likely to experience for the first time at Arcade Spins. Don’t assume that there are only slots here though, because there’s a plethora of table and card games to be found as well, to ensure that there are games to suit every taste. It’s a shame that Arcade Spins has so many negatives in terms of its practices, because when it comes to design and games selection, this could be one of the best online casinos around. However, until some changes are made to bonus requirements, pay-out limits, and more besides, Arcade Spins is not a site we can recommend.